Williams punctuates the poem only by use of a few capital letters, an apostrophe to indicate possession, and by the arrangement of the lines. However, formatted and punctuated differently, the poem could be used as a descriptive caption under a reprint of the painting in an art history book. And that's what I'd like you to do. First, what is a myth? Here are the definitions according to Dictionary dot com: myth. More powerfully, here is a bit about myths from 20th Century religion scholar and professor, Joseph Campbell: "Read the myths. They teach you that you can turn inward, and you begin to get the message of the symbols. Read other people's myths, not those of your own religion, because you tend to interpret your own religion in terms of facts - but if you read the other ones, you begin to get the message. Myth helps you to put your mind in touch with this experience of being alive." Elsewhere, Campbell defines "myth," simply stated, as "another man's religion," positing that it is dangerous to think of one's own religion as holding "absolute truths" while denegrating the beliefs of others as mere "myth." Read part of his 1988 interview for Public Television in the series titled Joseph Campbell and the Power of Myth. Next, it would help to know something about the Icarus myth, so take the following link to Thomas Bulfinch's Mythology web site and scroll down about half way to find out about Daedalus and his son Icarus. Instructions: On a Microsoft Word document with your name(s) at the top, answer these three questions. 3. 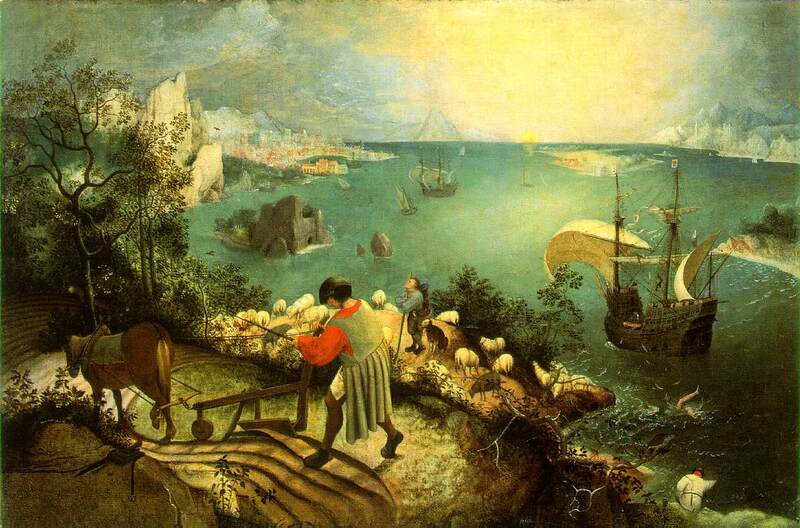 (In one or two sentences) What does this painting by Brueghel say about the nature of myths in the everyday world? Finally, highlight the text of the poem, and click the copy command from the edit menu on your browser. Then paste the poem into your Word document. Without rewording it in any way, refomat the poem into prose sentences and punctuate them correctly so that it describes the painting and conveys its meaning. This is due at the start of your next class.